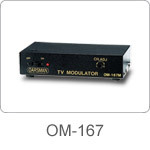 The OM-167 series are new designed VHF and UHF band modulators of LC type. They have a built-in high rejection filter to provide a clear modulation signal , and also have a wide band combine-circuit to easily combine exit signals form TV antenna or others. Uses IC circuit design that will be trusted by you. Other frequency range can be made in accordance with your request. The frequency range of CHF-HI and UHF band is 80MHz , maximum. VHF-LO band frequency range is 30 MHz, maximum. The highest frequency is 600MHz.